Today for Monday Morning Gossip I have a giveaway I'm really excited about! One lucky reader will win a pair of PJ boxers and a ¼ zip sweatshirt brought to you by Greek Life Girl, a brand by Memento. Memento makes all things monogrammed and preppy. Their Greek line features a long list of sororities they are licensed to create items for, and if your sorority is not on the list, they can start the process to become licensed. Pretty cool! I was lucky enough to be given a sweatshirt to review. 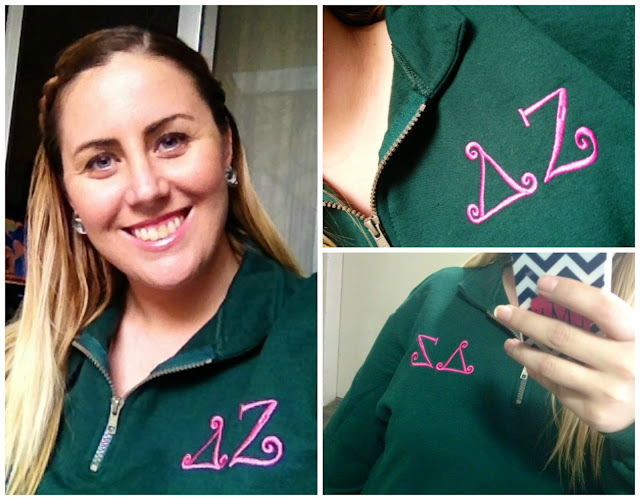 I chose my sorority letters and the colors of thread and sweatshirt - Delta Zeta/pink and green. Love it! It's comfy and looks really nice. I've been wearing it non-stop. I honestly am so impressed with the quality that I plan on ordering more from Memento. In addition to the Greek line, Memento offers a large selection of raincoats, monogrammed boot socks, sweatshirts, T-shirts, pocket tees, jerseys, pajamas, yoga pants, running shorts, jewelry, technology cases, and more. Pretty much anything you would want monogrammed. Best part is it's all adorable AND affordable! 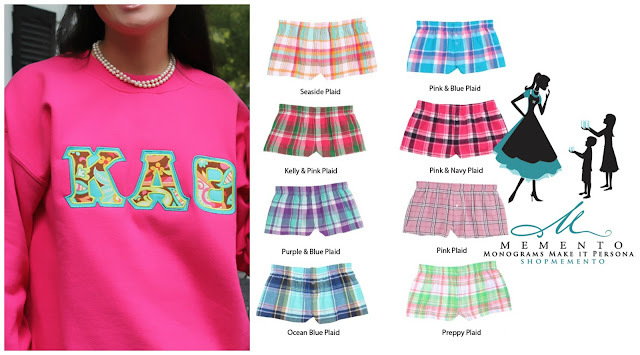 One luck lady will win a ¼ zip sweatshirt (like the one I'm wearing above) and PJ boxers both in the colors, sizes, sorority letters, and thread colors for embroidery. Not affiliated with a sorority? That's OK. You can still enter the giveaway. Instead of sorority letters you can elect to do a monogram! Disclaimer: I was given a sweatshirt for free in exchange for an honest review. All opinion are truthful and my own. IF YOU'RE LINKING UP TODAY, BE SURE TO ENTER THE GIVEAWAY. YOU'LL GET 5 EXTRA ENTRIES! Super cute giveaway! Hope your new job is going wonderfully. This is the first Giveaway that I did EVERYTHING. A) I like to follow you via all social media and B) I wanna win!!! I would so pimp them out to DPhiE if I won. Pick me! Pick me! I want one!! Give me your sweater!!! So cute!!! I'm a DZ too :) I'm loving this giveaway!! cute and very nice giveaway, i hope i live in the US so I can join this. happy monday. i hope your new job is doing great. Just entered - hope I win!! Sooooo hope I win! Not gonna lie, I had a giveaway for them a few weeks ago but I love it so much that I'm entering this one too. THIS IS HOW AWESOME THIS IS, Y'ALL. oooo they have my house! Yay!